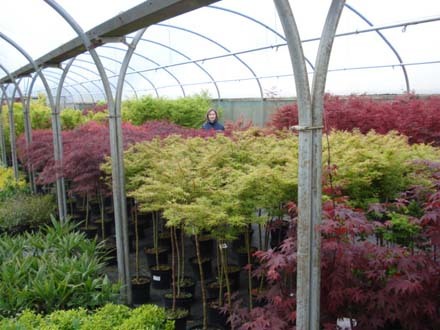 Acer Palmatum or Japanese Maples include ever increasing numbers of new and interesting forms. They range from dwarf shrubs up to small trees. They are fairly easy to grow and prefer a little dapple shade and a site out of strong winds and are best planted in slightly acidic soil that is not too wet. If your soil is not acidic, include some peat when backfilling the planting hole. Pruning Japanese Maples should ideally be carried out in Autumn/Winter when the sap is falling. If it is imperative that pruning is done at any other time of the year then you should ideally use a wound seal treatment on the cut to avoid decay setting in. It's not actually a bad idea to get into the habit of using a woundseal treatment everytime you cut into an Acer. Be careful not to over feed your Acer; use little and often and use organic chicken pellets or ericaceous food. No garden is complete without the beauty of a Japanese Maple. The colour in the Autumn alone is enough to warrant their use. Add to that the pleasure of the delicate foliage swaying gently in a summer breeze and you have perfection for 9 months of the year. They are also the perfect plant for a pot. If they are in a pot remember to wrap the pot well in Winter or take inside to stop the frost killing the roots. The dissectum varieties are better for smaller shrubs, forming domes of arching, deeply cut leaves.